U-Reach, a data equipment expert, brings competitive, market-leading products and professional solutions for CFast memory duplication and inspection. CFast memory is the future solution for efficient data transfer. 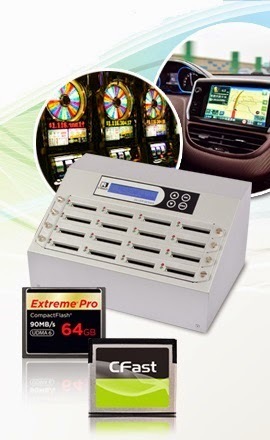 Nowadays, it is widely used in embedded systems, POS systems, arcade gaming systems, and automotive systems. With an SATA adapter, CFast memory can be a boot disk for any IPC sever & PC system. Moreover, it can be easily found in professional motion picture equipment. U-Reach is offering the latest, professional CFast duplicator on the market. The U-Reach CFast duplicator can duplicate up to a maximum of 119 CFast memories. Also it enables data transfers at 3.9GB/min for each individual CFast memory with minimal speed transfer loss. New additional inspection functions such as: speed tests, quality tests, read/write tests, and event log report and durability tests are now integrated into the U-Reach CFast duplicator to benefit end-users. The U-Reach CFast duplicator offers CF and CFast quick socket reallocation modules, and this design gives users a wide range of usage. The duplicator provides various models from 1-3, 1-7 to 1-119 ; satisfying all end-users’ need. For further understanding about the CFast duplicator, please log onto www.ureach-usa.com. U-Reach GmbH at embedded world.